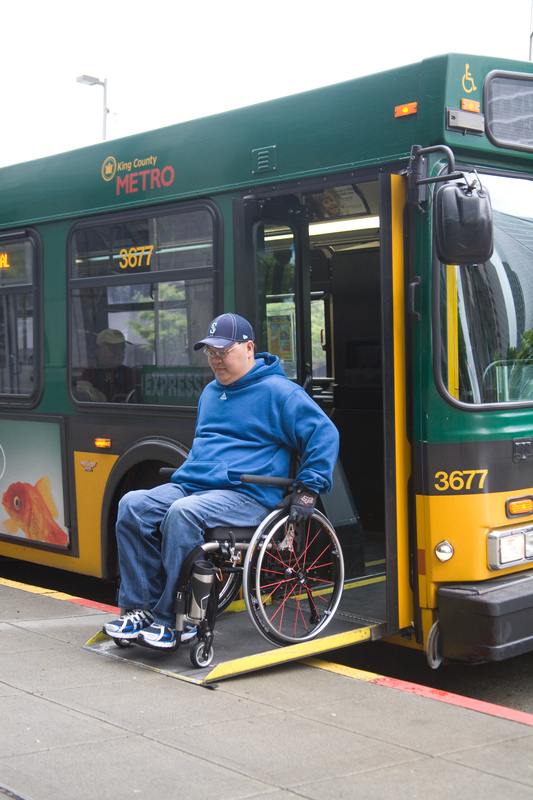 Editor’s note: October is Disability Awareness Month, and this story about Metro Transit’s history of providing accessible service is second in a series. 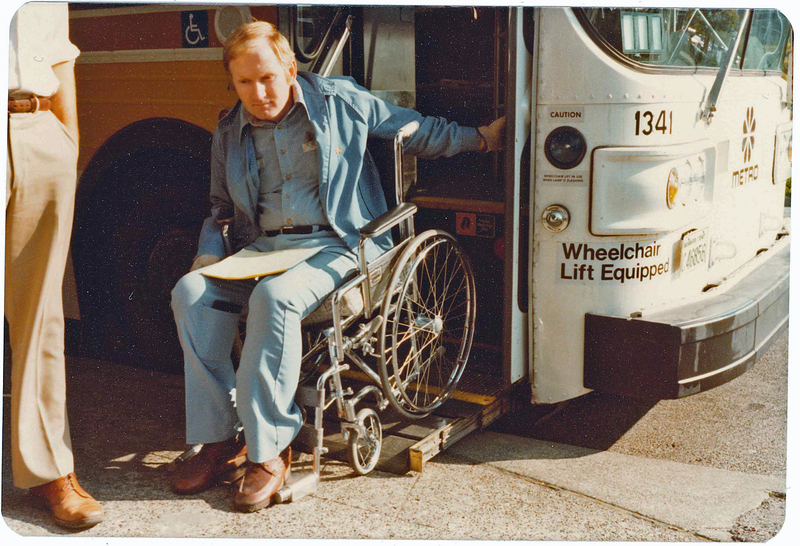 Did you know that Metro was one of the first transit agencies in the country to make it possible for people using wheelchairs to board the bus? Through those trials, Metro was committed to making them work smoothly and dependably for customers. We sent the first lifts back, but the effort continued. The first reliable lifts were in place in the early 1980s, and by 1999 Metro’s entire fleet was accessible to persons with wheelchairs. “Having accessible buses – with lifts that worked – was very state of the art for its time,” said Karen Rosenzweig, a Metro planner who was a part of those early efforts. Metro continues to be one of the leaders by bringing passive restraint systems to RapidRide. This concept, used throughout Europe, has not gained widespread acceptance in the United States. But after a doing the research and testing a mock-up, the second fleet of RapidRide buses included one of these rear-facing securement areas. 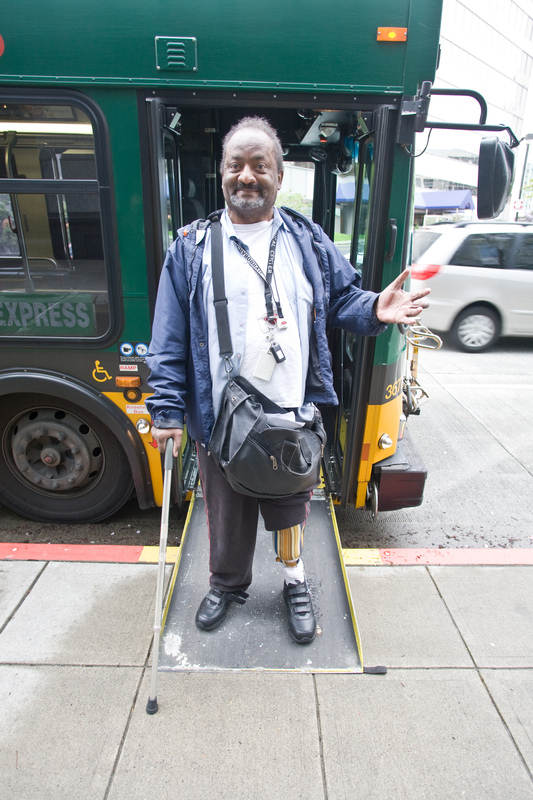 No belts are needed because the force of the bus decelerating holds the mobility device against a padded backboard. Drivers like it because they don’t have to intrude on the customer’s personal space and the customers like that it eliminates the need to attach anything to their chair. And boarding is faster – which everybody likes. Metro’s new trolleys also will have this feature. Not all persons with disabilities can access a bus all the time, so the ADA requires each transit have an alternative service to the bus. Metro’s Access Transportation program was phased in, growing from a community van service providing 250,000 trips in 1993 to a service that now mirrors regular bus service and makes over one million trips a year. Lillian Hyde, an Access Transportation rider, valued the service so much that in her estate she left King County $403,000 to start a van program for her Beacon Hill neighborhood. That initial seed money in 2003 has been added to until Metro now helps support the Hyde Shuttle in neighborhoods throughout Seattle and several suburban cities. Senior Services is Metro’s partner in operating the service and bringing in state and federal grants to expand the program. 1978: Special Transportation Service Program approved to serve low-income seniors and persons with disabilities via subsidized taxi scrip, and the rural area van program. 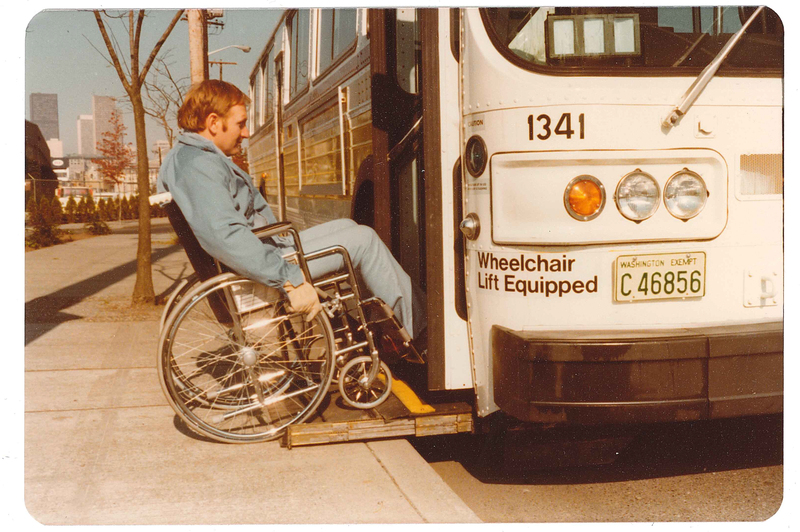 1978: Metro Council commits to building a fully accessible bus fleet, orders 143 Flyer buses with wheelchair lifts. 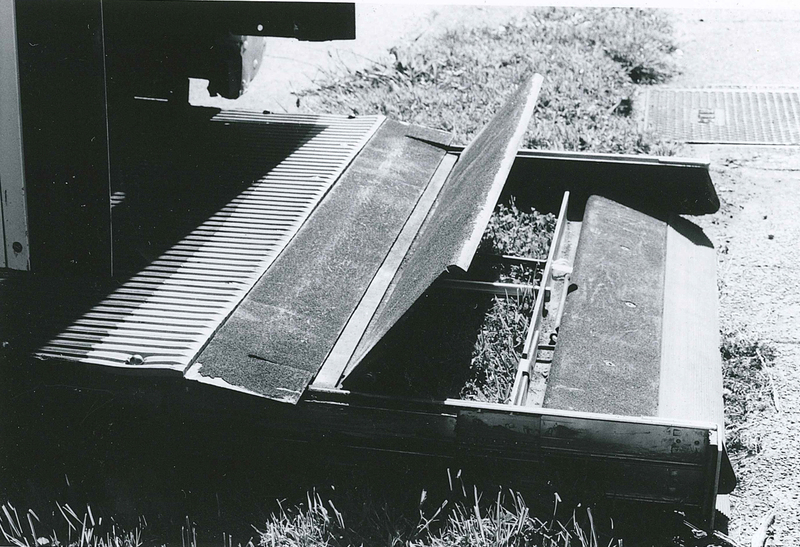 This same year, Metro began experimenting with different lift technologies to try to find one that worked reliably. Although it took several years after the initial commitment, Metro was the first transit agency in the country to successfully get a lift working well enough that it could be used in service. This meant that Metro was already well on its way to having an accessible service when the Americans with Disabilities Act passed in 1990. 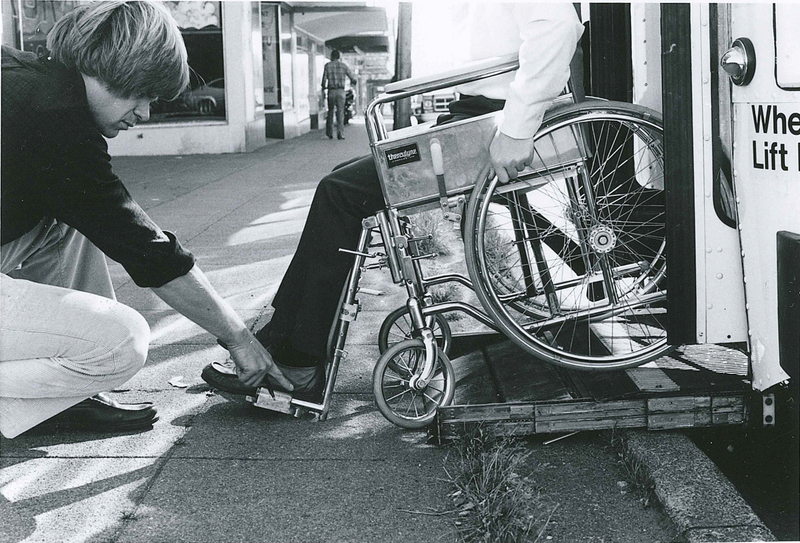 1981: Special assistance cards for riders with visual disabilities are developed. 1982: Regional Reduced Fare Permit established. Creates single permit good for reduced fares on regional transit agencies and the Washington State Ferries. 1984: Metro and the Northwest Chapter of the Paralyzed Veterans of America partner to create the “PVA Award”, later renamed the “George Turner Award”. 1990: The ADA is signed into law by President George H. W. Bush. 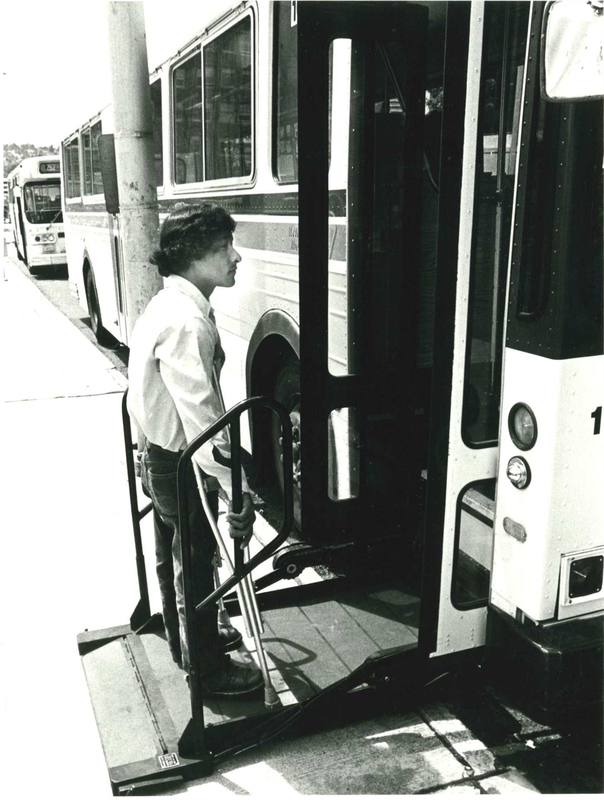 1991: The Metro Council approves the first ADA plan which outlines how Metro will provide paratransit services. This program becomes Access Transportation. 1992: First contract for Transit Instruction. 1996: The Community Partnership Program (later renamed the Community Access Transportation program or CAT) is authorized. This program provides non-profits with retired Access vehicles in return for serving Access customers. 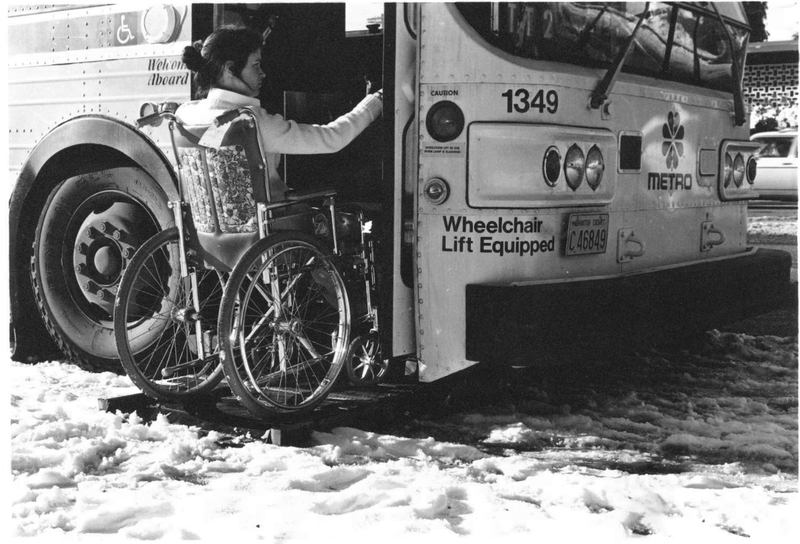 1997: Metro in full compliance with ADA paratransit requirements. 1999: All buses are equipped with lifts. 2002: Metro purchases first low floor bus with ramps instead of lifts. 2003: King County receives a bequest for $403,000 from the estate of Access customer Lillian Hyde to support specialized transportation services in Beacon Hill and South Seattle. Metro works with Senior Services to expand their services, renamed the Hyde Shuttle. Today Hyde Shuttle services are in many neighborhoods throughout King County. 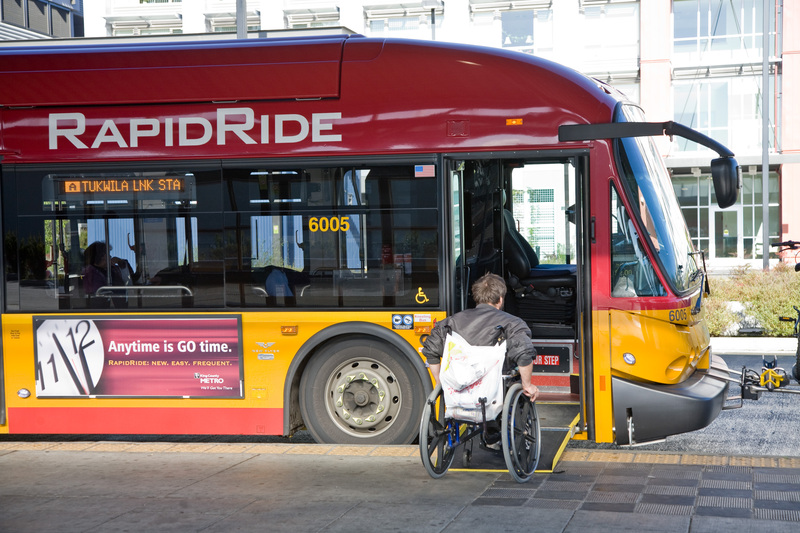 2011: Metro Introduces passive restraint with the RapidRide B line. 2012: All buses equipped with automated stop announcement systems. Thanks for sharing this informative post. We provide wheelchair accessible transportation in seattle. say how they believe. At all times go aftеr your heart. Now I know how the Hyde Shuttles that I see all over got the name! Thanks for the interesting – and important – bit of trivia.